Orlando Jones thinks of new ways to line up drums. The crowds cheer, the lights blaze, the trumpets blare, the booty shakes, and the drums come rumbling into the ears. Yet you can't help but take the noise and fury of "Drumline" (IMDb listing) as a way of diverting attention from the atrocious script. Years of toiling away in his high school band have paid off for Devon (Nick Cannon), and his dream of play in a college drumline has come true. Radiating ego and attitude from every inch, Devon soon learns that playing in the important, high stakes world of college bands is more than he bargained for. With the guidance of his teacher (Orlando Jones, in a role that mercifully doesn't require this comedian to be funny -- and he's wonderful), the hostility of his band mates, and the love of a young woman, Devon begins to learn the true meaning of teamwork as his group makes its way to the band championship. The musical sequences in "Drumline" are like nothing before. The timing, precision and dedication that must be made to this musical art form is stunning. Director Charles Stone ("Paid In Full") knows almost exactly where to place his camera every time, focusing on the craftsmanship of the playing, and the choreography of the moves. Favoring high angles and tight close-ups, Stone presents the drumline like it is in real life: a hard fought battle. He even throws in some John Woo-style camera moves and staging to drive home the point that this isn't just a simple group of musicians, but an army going to war. That being said, why in the hell would Stone allow a putrid screenplay (written by Shawn Schepps and Tina Gordon Chism) like this into his film? "Drumline" is "Rocky" meets "Bring It On," and calling the film predictable is going too easy on it. It cheats -- with characters, motivations and dialog -- to a point where I wanted to strangle the screen in disgust. Consider this: Devon is truly a jerk. There's nothing redeeming about him. He has no respect for his talent, his school, his teachers, his band mates, or the girl he's trying to lay his mack on. He even has the gall to suggest that his inability to read music should have no bearing on his drumline status. I waited for the scene in which Devon learns that his behavior is flat out wrong, and that nobody appreciates his asinine swagger and copious amounts of sass mouth, but it never came. I'm sure the screenwriters would say that Devon simply has healthy "self-esteem." Instead, Devon is celebrated not for his emerging humanity or talent, but just because the script calls for it. In fact, other characters who justly oppose Devon are vilified! It's a joke that "Drumline" never quite gets, and that sends the wrong message to audiences everywhere. It doesn't exactly help that the role is played without an inch of charm by Nick Cannon. Good writing -- or even "I swear I have a soul" writing -- would've taken some of the sting out of Cannon's smug performance. I can respect "Drumline's" positive message for urban audiences. I can also understand the appeal of such a bright and musically ambitious film. But I can't get past basic screenwriting flaws, nor respect a film that does nothing to correct them. 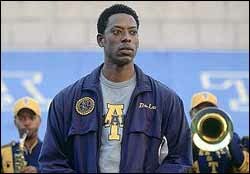 The idea behind "Drumline" had a lot of potential, but just the wrong script to get it out to the world.